The Colonial Lodge Motel have been in business since 1969, proudly supporting the Hawke’s Bay community. There's a Great reason why we are ranked No. 3 for Hotels in Napier. Lot's of happy customers. There are two words that best describe The Hawke’s Bay and they are Wine Country. Our great location is the perfect spot to enjoy your favourite activities in the Hawke’s Bay. The Colonial Lodge Motel has been owned by the Johnson family since 1969. 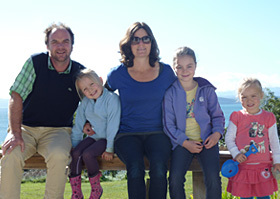 Mark and Sarah are Hawke’s Bay originals, and they are considered local experts when it comes to family holidays, and weekend get-away fun.